Osorio is specifically mad about a moment in the second half which he said killed Mexico’s momentum. 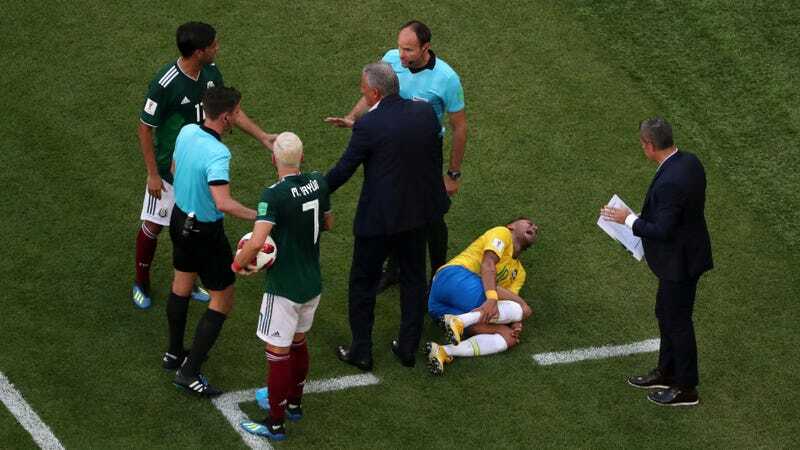 In the 72nd minute, and with a 1-0 lead, Neymar reacted (per some observers) a little strongly to some contact from Mexico’s Miguel Layun, causing further delay on a restart after the ball went out of bounds. According to Osorio (one observer), the Brazil player’s theatrics wasted precious minutes, may have corrupted children and—perhaps worst of all—was not manly. “It’s not a good example for soccer, and for the world of soccer, for all the kids playing,” Osorio said at his press conference. “This is a game of men and not one with so much clowning,” he added. While Osorio seemed annoyed in the press conference, after a few minutes to cool down, the manager was less cooled down and slinging arrows with reckless abandon in the moments immediately following his loss. It’s unclear whether Osorio is genuinely angry; hoping that he can salvage his reputation for Mexico (or his next job) after this stagnant World Cup showing; trying to fire off some more shots before ditching the CONCACAF scene that he’s called “unsafe and dangerous”; or some combination of some or all of the above. If he’s just generally angry, all of this isn’t a bad mic drop. If he’s angry about something in particular, he may or may not be right, but who could tell?